By Maxine Ashford on 2018-12-04 - Maxine has been a journalist since the late 1980s and for the past 13 years has specialised in motoring. Former motoring editor at Media Wales responsible for the Western Mail, South Wales Echo, Wales on Sunday. Freelance since 2009, Maxine loves cars but not quite as much as rugby! 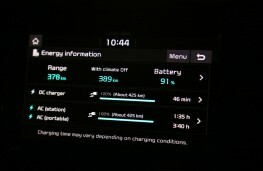 THINK electric car and think range anxiety, right? 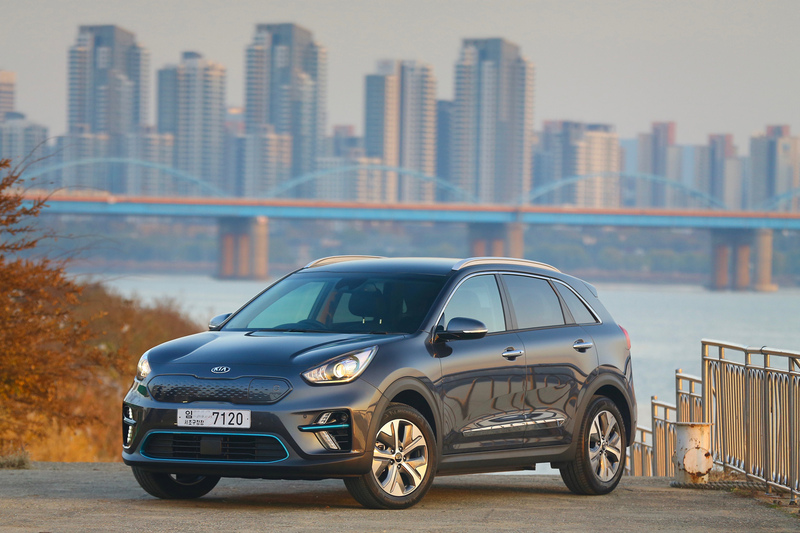 Not necessarily, as Kia has proven with the launch of its all-electric e-Niro model with a range of almost 300 miles between charges. 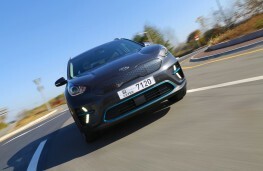 It's the Korean company's second electrification venture following on from the success of the Soul EV and it has plenty of all-round appeal. 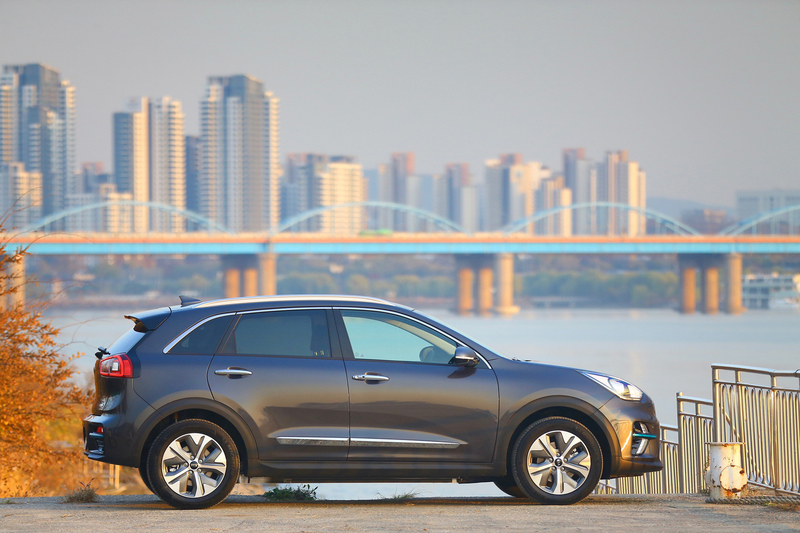 The e-Niro has a stylish crossover design, it's practical, comfortable, delivers great driving dynamics and has a zero-carbon emissions figure. 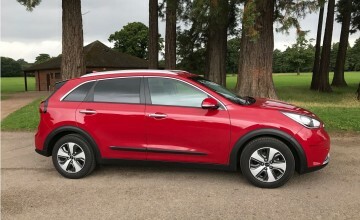 Okay, so it's not exactly cheap with an asking price of Â£32,995 and that's with the Â£3,500 Government grant deducted, but in an age where we are being driven towards eco-friendly motoring, the e-Niro is a perfect example of how well it can be achieved. 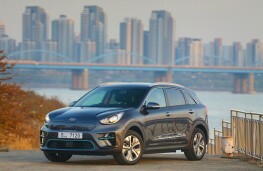 The Niro name will be familiar to many as the car was launched in the UK in 2016 in hybrid and plug-in hybrid EV guise. 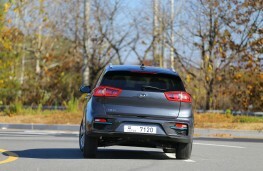 But from next April, there's an all-electric version of the front-wheel drive, five-door crossover. 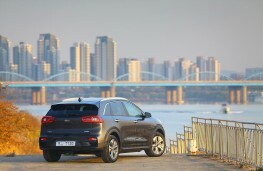 It's certainly an eye-catching, good-looking car with a matt black radiator grille where the charging port is hidden along with a de-bossed Niro logo. There are roof rails, a rear spoiler, privacy glass, solar glass, black side sill and wheel arch mouldings, chrome coated door handles and 17-inch alloy wheels. 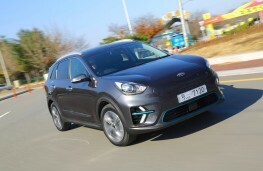 And to help the car really stand out, it features redesigned air intakes and new arrow-shaped LED daytime running lights with blue trim highlights. 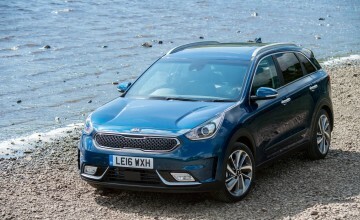 The e-Niro is powered by a 64kWh battery pack paired with a 210bhp motor, producing 395Nm of torque which enables the car to accelerate from 0-60mph in an impressive 7.5 seconds with a top speed of 104mph. But it's the manner in which the car performs that really impresses as we discovered on a route in South Korea that incorporated motorways, twisting country lanes and the heavily congested Seoul streets. 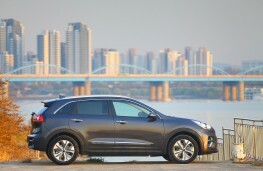 According to the new fuel economy tests the e-Niro has a range of 282 miles for the longer range 64kWh model and 179 miles for the standard car which has a lower powered battery pack. 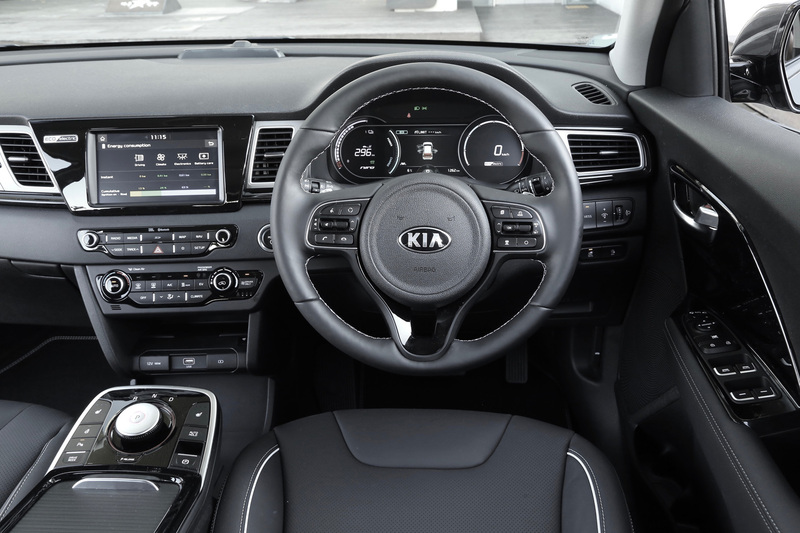 There is just one drive gear but the driver can select from Normal, Eco and Sport modes which alter the amount of effort it takes to steer the car and also changes the character of the powertrain. 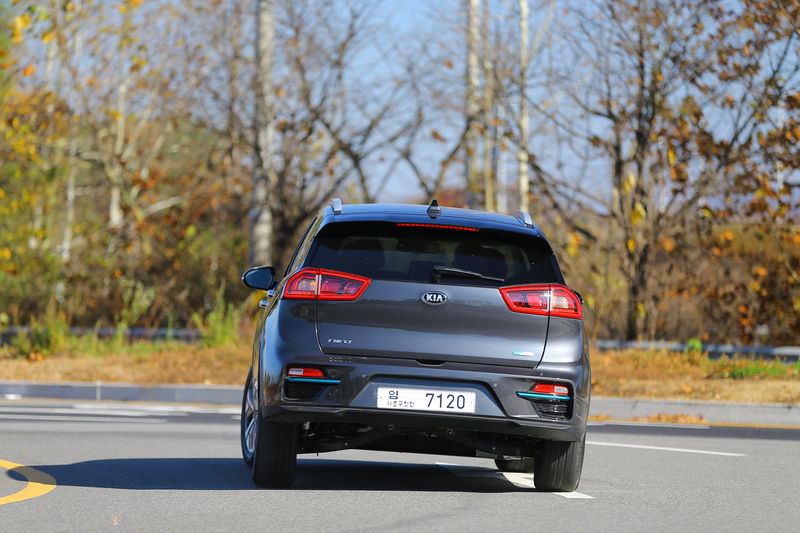 Normal is the most suitable for day-to-day motoring, but the Sport mode was great when faced with some twisting roads - the steering becomes more weighted and the throttle more responsive resulting in far more engaging handling capabilities. 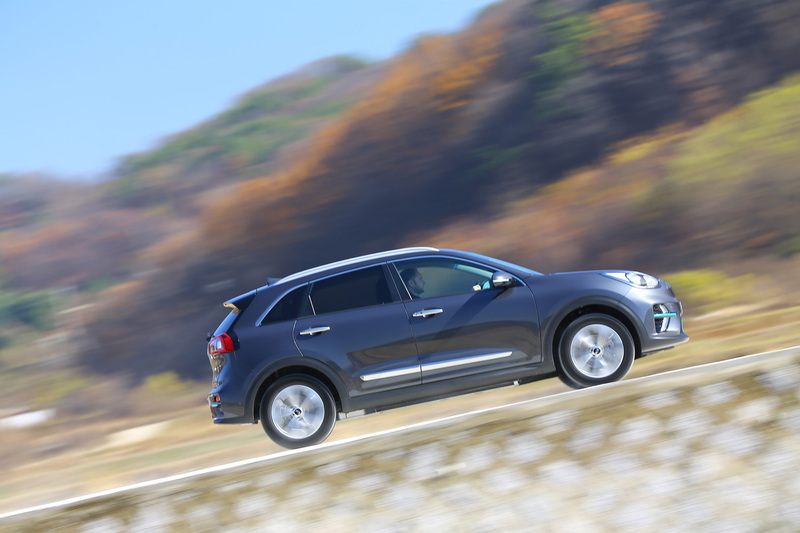 The e-Niro accelerates swiftly and steep inclines pose no problems either with a constant supply of power on tap. 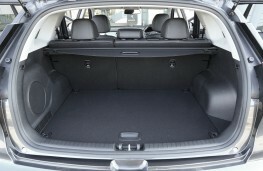 The battery pack is located low down in the car's body between the two axles, so the vehicle boasts a low centre of gravity that is more akin to a saloon car. And the wide stance means the e-Niro feels very stable and sure-footed when cornering. It is nicely refined at lower speeds, but we did notice more road surface and wind noise at higher motorway speeds, but it's not too bad at all. The effective suspension set-up dealt well with the majority of bumps and dips along the way, but on occasion, a larger pothole did send reverberations through the cabin. 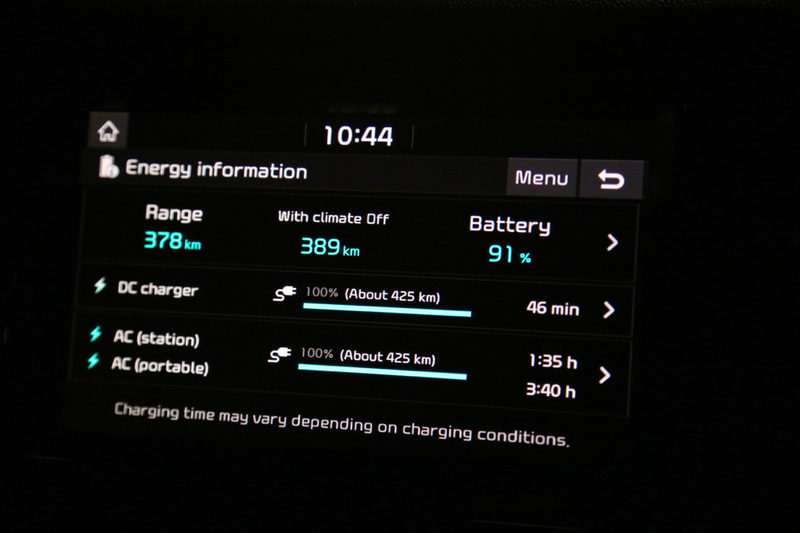 While the interior of the car is not too futuristic, the dials and readouts are EV-orientated with information regarding battery charge percentage, the estimated range the car is capable of achieving, driving styles and the location of the nearest charge points. There is also a lamp integrated into the top of the dashboard with a light that displays whether the battery pack is recharging or fully charged when plugged in. 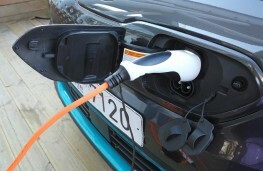 This enables the owner to quickly assess the car's charging status at a glance. 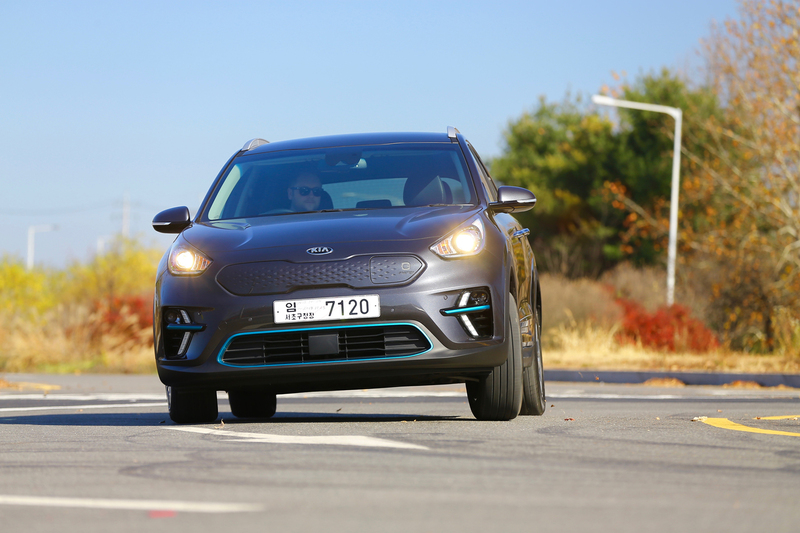 Regenerative braking technology allows the e-Niro to harvest kinetic energy and recharge the battery pack while coasting or braking with driver prompts of when to lift their foot off the accelerator to maximise this process. And although there is no transmission, there is a pair of steering wheel-mounted paddles which allow the driver to choose between three levels of energy recuperation with the higher the level selected, the more energy the regenerative brakes try to harvest. This system was so effective, the car could actually be brought to a complete standstill in stop/start traffic without touching the brake pedal. Comfort is another area where the e-Niro excels. Thanks to its upright crossover design there is ample room for four adults to travel in style with lots of leg, shoulder and head space in the back. The slightly elevated seating means the driver benefits from excellent all-round visibility and storage levels are also impressive with a boot capacity that ranges from 451 to 1,405 litres with the 60:40 split folding rear seats dropped flat. The charging cable is located in a hide-away compartment beneath the boot floor. 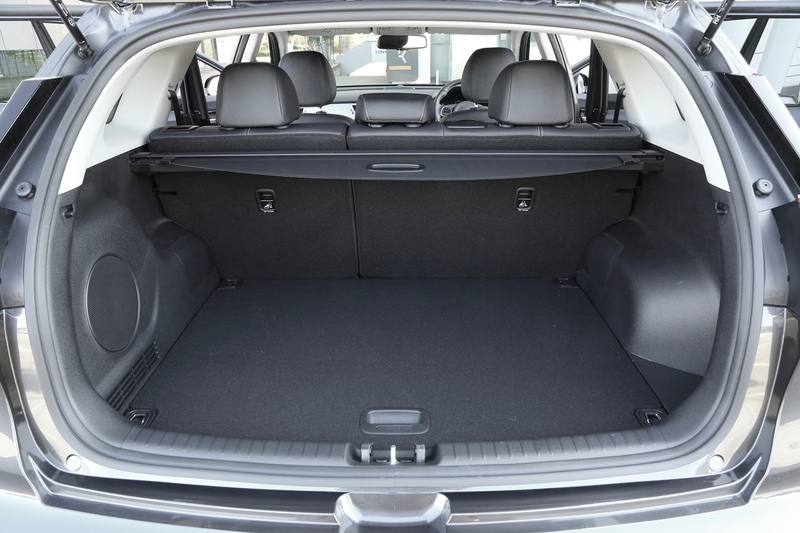 Other storage options include door bins with a designated bottle holder, a glovebox, a huge tray beneath the centre console, a sunglasses compartment, cup holders and a covered central box. Kia has a reputation for developing generously-equipped cars with no hidden extra costs and the e-Niro is another fine example with a wealth of technology to be explored. There is just one trim level and creature comforts include black leather upholstery, attractive bright blue trim around the air vents, mood lighting, heated seats, a heated steering wheel, an eight-inch touchscreen navigation system with European mapping and traffic monitoring, full smartphone connectivity via Apple CarPlay or Android Auto, wireless mobile phone charging, an eight-speaker JBL sound system, Bluetooth with music streaming, a DAB radio, all-round electric windows and lots more besides. 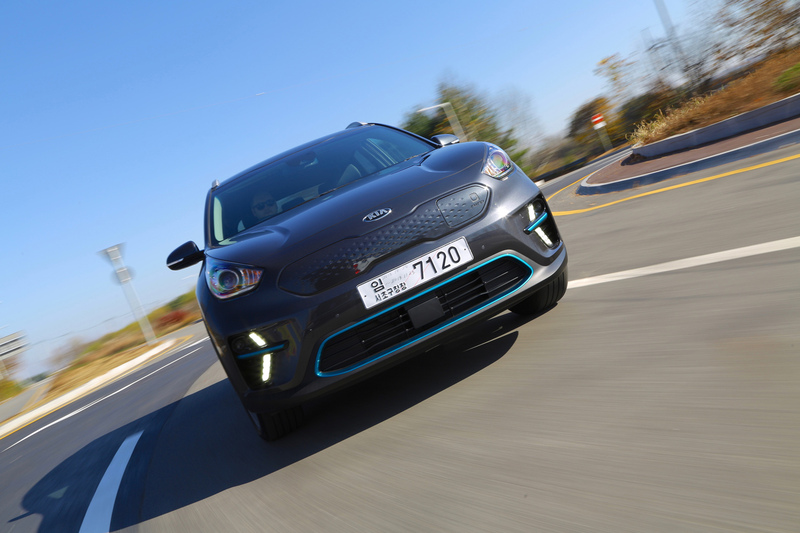 The car can be charged up to 80 per cent in just 54 minutes on a 100kW fast charger. More standard domestic outputs can take longer - for example a 7.2kW power source will take almost 10 hours to charge from 0 to 100 per cent. 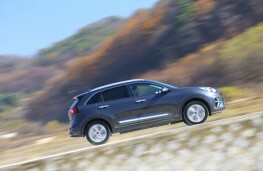 But with its very realistic 300-mile range, planning ahead is quite easy. 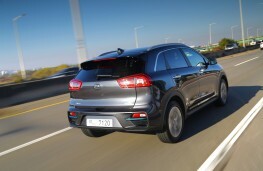 Although the e-Niro has not yet been tested for its Euro NCAP safety rating, Kia is aiming for the maximum five stars. On-board safety kit includes anti-lock brakes, electronic stability control, forward collision avoidance assist, lane keep assist, hill start assist, tyre pressure monitoring and seven airbags. 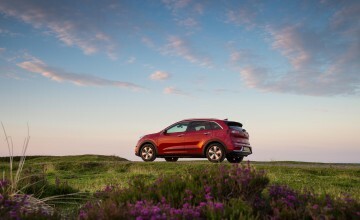 All in all, the e-Niro is an inspiring glimpse into a future when all our cars will be eco-friendly. And it's a reassuring insight too, proving that electric vehicles don't have to look and sound like milk floats. Neither do they need to cost and arm and a leg and they don't need to be dull, lame and uninspiring to drive. The e-Niro is anything but, and it comes with Kia's industry-leading seven-year warranty that also covers the battery pack and electric motor.